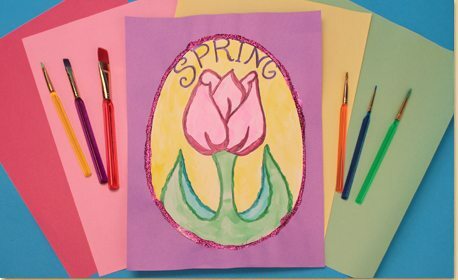 Using different types of brushes, learn to make your paintings more interesting when completing a finished spring themed design. 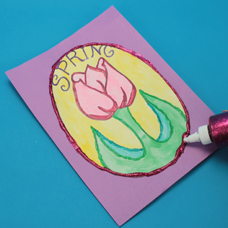 Skinny brush strokes are great for lettering and wider brush strokes look great for other areas, such as flower petals. Pink Glitter Glue 8 oz. 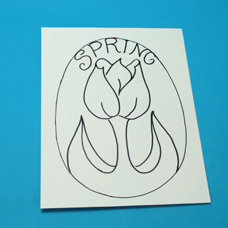 Click the “template” button to download and print the template onto the white card stock. Using the largest brush, start painting in the background of the template picture with the watercolor paint. Switch to a medium size brush to finish painting the picture. 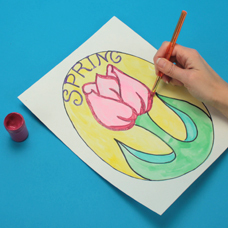 Start with the smallest brush and outline the word “spring” with the acrylic paint. Next, pick the brush that has angled bristles. 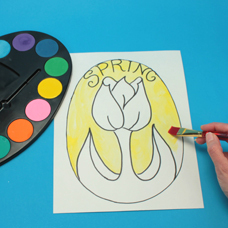 Apply acrylic paint to the brush, and start outlining the edge of the tulip, starting at the top. Turn the brush sideways to get a thin brush stroke, as shown. 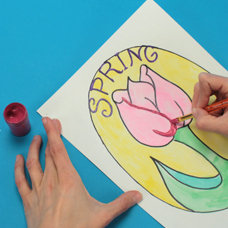 Continue outlining the petals of the flower, changing the way you hold the brush to get a variety of brush strokes. Switch to the Medium round brush to outline the leaves. 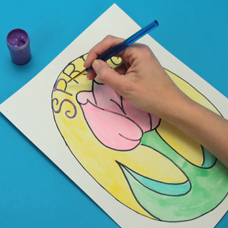 Apply the paint very thick along the outline, using short vertical brush strokes. This will give the paint some texture around the leaves and create an interesting effect. Let Dry. 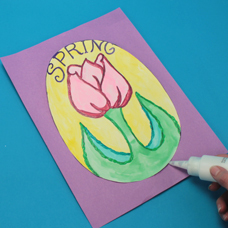 Cut out the painting and glue onto a bright piece of construction paper. 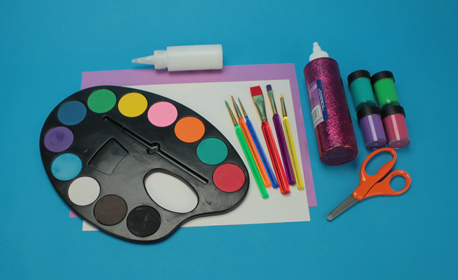 Outline the template’s edge in glitter glue for a finished look. 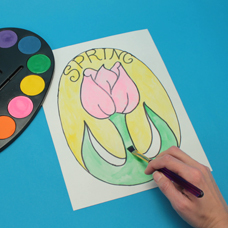 After drying, your spring design is ready to display!